Law enforcement officials work following an explosion near New York's Times Square, Dec. 11, 2017. A would-be terrorist set off a pipe bomb strapped to his chest in a pedestrian tunnel between two of New York City's busiest transportation hubs Monday. Akayed Ullah, 27, who came to the U.S. from Bangladesh, wounded himself and three bystanders in what Mayor Bill de Blasio calls an attempted terrorist attack. “Thank God the perpetrator dId not achieve his goals,” the mayor said. This undated photo provided by the New York City Taxi and Limousine Commission shows Akayed Ullah, the suspect in the explosion near New York's Times Square, Dec. 11, 2017. Police released pictures of the alleged bomber, lying on the ground in a fetal position. Some of his clothes were blown off and his stomach was blackened. Doctors say the injured bystanders suffered ringing in the ears and headaches. Federal and New York City investigators questioned Ullah from his hospital bed and searched his Brooklyn apartment. 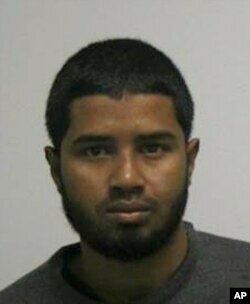 Ullah allegedly exploded the bomb in a tunnel connecting the Port Authority Bus Terminal with the Times Square subway stop. The tunnel and stops were packed with tourists and commuters hustling to their jobs in Manhattan. Television pictures show the tunnel filling with smoke while people streamed out of the walkway to safety, not knowing what kind of calamity would greet them outside. Port Authority was shut down for several hours as well as major intersections right in the heart of New York. “Crazy people are everywhere, every time, and New York is a big place, and a public place so it is normal I think,” Ruben Schwartz, a tourist from Germany, told VOA. ​Ullah came to the United States from Bangladesh about seven years ago and was a legal permanent U.S. resident. “The government of Bangladesh is committed to its declared policy of ‘zero tolerance’ against terrorism and condemns terrorism and violent extremism in all forms or manifestations anywhere in the world,” an embassy statement said Monday. Ullah came to the U.S. to join family members — something called family chain migration and something President Donald Trump says is "incompatible with national security." "Congress must end chain migration," a Trump statement said Monday. "The terrible harm that this flawed system inflicts on America's security and economy has long been clear. I'm determined to improve our immigration system to put our country and our people first." Ullah’s alleged motives are unclear. Officials say he may have been inspired by Islamic State. They believe he acted alone. White House Press Secretary Sarah Huckabee Sanders said Monday’s blast is a sign that Congress must pass tighter restrictions for people who want to immigrate to the United States. “We must protect our borders, we must ensure that individuals entering our country are not coming to do harm to our people, and we must move to a merit-based system of immigration,” she said. This was the second apparent terror attack in New York in the past two months. An ISIS sympathizer drove a rented truck along a bicycle path in Manhattan in late October, killing eight. Ramon Taylor, Asli Pelit, Jeff Seldin contributed to this report.